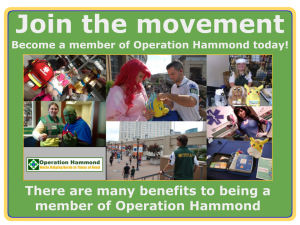 Volunteering with Operation Hammond is a fantastic way to meet new people, learn new skills, and help out at great pop culture events and conventions. There are many benefits to being a member in Operation Hammond. We offer free First Aid and CPR training to all our members, admittance to fantastic shows and convention, and room and board to our members when they work with us at shows and conventions. We’re actively looking for new members to help grow our organization, so please fill out the form below and become a member today. If you would like to learn more or have any questions, please email us at info@operationhammond.com Be sure to like us on Facebook and follow us on Twitter. Please fill out the form and click submit. You must be at least 18 years of age to volunteer, We are a kink friendly organization, membership restrictions apply.